You could go to a town meeting and shout, protest in front of a Fed building, write letters for your Congressman to throw away -- or, you could sit and peacefully sip on coffee or tea and make the strongest statement of all. 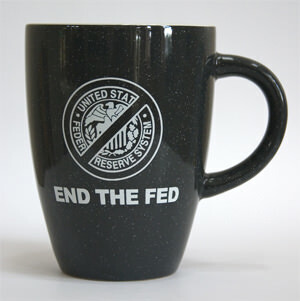 End The Fed is the cause to celebrate but sometimes a graphic is worth one million words. And just so that no one thinks that you have a narrow-mind focused only on wrecking the official counterfeiting machine and then walking away, this mug also shows your attachment to the ideals of Liberty, Property, and Peace. This contemporary design features a contrasting-color interior glaze and rim accent color. Colors are charcoal and gray. This has supplanted my Shakespeare Insults mug as my favorite cup. In fact, I have forbidden my wife to wash it, not that I like a dirty cup... oh no, I wash it myself. It's just that she has broken so many coffee cups that I don't let her near it. 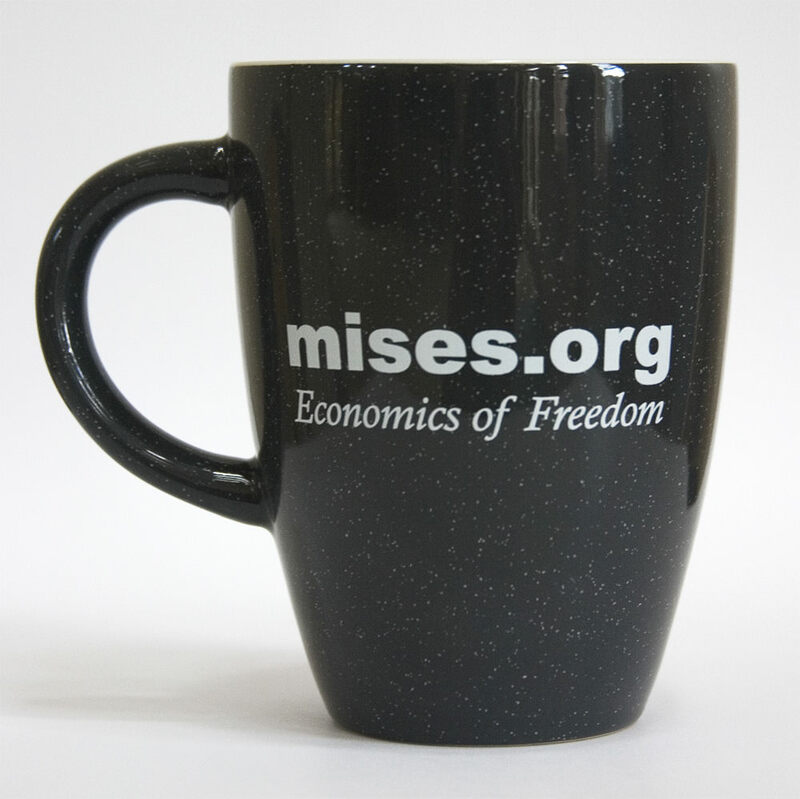 If anyone at Mises.org reads these reviews I would ask: make more coffee cup designs. A functional liquidity trap for you and the family. The smaller base means the mug is easily affected by recessions or depressions but the large handle allows for rapid correction. A taller design in the structure of production will lend its bias toward greater consumption. You'll raise interest as co-workers and friends demand your loanable funds to get one or two of their own. Twelve ounce bag of organic whole bean coffee. Roasted fresh for the Mises Institute here in Auburn, AL. On sale for a limited time. 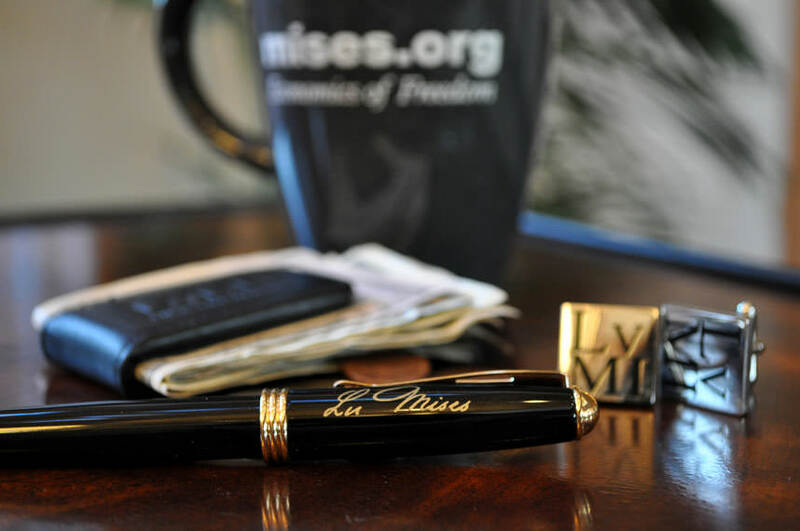 LvMI logo imprinted on one side and tu ne cede malis, Mises's life long motto on the other.